The Fuel is a high aspect ratio Traditional C kite with a medium diameter leading edge, supported by 5 thin struts. The kite is very well reinforced in all the usual places, and slingshot have gone the extra mile with the stitching to ensure they live up to their bomber proof standards (such as triple stitching on the LE seams, and double on the canopy). The kite has a surprisingly large number of panels which must help with its rigidity. Like all Slingshot kites, its a one-pump affair – which gets you out on the water quickly, and is quick to pack away also. 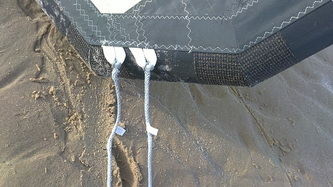 There are two front line attachment points which sit pretty closely together on the leading edge, allowing the kite to be tuned for freestyle or wake-style. The slingshot bar is a meaty affair, and is a product of real quality. The bar itself is weighty with a rubberised grip which looks like it will stand the test of time. The safety system looks up there with the best of them – a push away release which flags the kite onto a single front line and a ‘suicide’ attachment point to cover all bases. The flying lines are exceptionally good also – 800lb front lines with thinner rear lines to reduce overall line drag. The bar comes with a clam cleat beneath the bar which will please anyone who normally struggles to reach above the bar sheeting systems. The larger kites in the range come with a 23 inch bar and 27m lines, mid-sized kites use a 20 inch bar with 23m lines, and the smaller sizes use a 17inch bar with 20m lines. Due to the light wind conditions on the first test day, I got the opportunity to give the Fuel a good fly on land. It’s a real pleasure to fly and it’s plain to see what 10 years of refinement brings. The kite is so rigid in the air, turning is precise with great feedback and it feels oh so right, making other kites feel dull and unresponsive in comparison. The fuel sits in the air just where you left it whilst handlepassing, and was a kite which I was very eager to take out on the water to put through its paces further. The Fuel generates a great deal of power when it’s moved through the window, and kiteloops send you scudding down the beach in winds well under 10mph. Launch and re-launch are exceptional – pulling on a back line causes the kite to pivot effortlessly, it needs to be seen to be believed! The Fuel can also easily be reverse-launched, if that option proves to be preferable. The bottom end of the fuel is impressive as bucket loads of power can be generated by working it through the window. The kite flies off the front lines with light bar pressure, and will sit happily in the sky unless the bar is steered assertively. The kite is great for aggressive free-riding – blasting up and down with powered turns, jumps and kiteloops which are sure to get the adrenaline pumping. Boosting on the Fuel requires technique on the flat, as you can get pulled off your edge if you're not expecting the power it generates, but it can go truely huge as Lewis demonstrates in the video at the bottom of the page! As you'd expect, the Fuel excels when unhooking - pop is very predictable and explosive but does require a certain amount of kite power. There is a good deal of line slack in the air for nailing those air-passes and hooking back in on landing is child's play. I wasn't able to test the top end of the Fuel, but power which feels a little much on the beach just feels great on the water - to get the most out of this kite you really do want it powered! 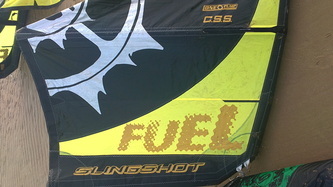 The Fuel certainly isn’t a mass-market kite and probably never will be, but for aggressive adrenalin-pumping free riding, slamming out huge kiteloops or busting expert unhooked moves its performance is at the top of the game. Its build quality and outstanding performance are testament to 10 years of refinement by Slingshot – If you’re and advanced rider, you’ll definitely want to give it a try - there isn't another kite out there quite like it!